Absolutely beautiful, I think I prefer wild garlic in the woods to bluebells! @judithdeacon We must be similar, I prefer dandelions to roses! Beautiful wood, path and flowers. A great,nice capture of it. And a beautiful path it is- love all the flowers. Very magical. Very pretty place for a walk. Oh my this is a gorgeous scene! Oh my - what a lovely scene, especially the mass of white flowers. Gorgeous! A beautiful shot - the smell is coming over!! This is really lovely, I can smell it if I lean into the screen! Beautiful capture - you beat me to it. I have been waiting for the wild garlic to flower in the Dingle, but it won't be as wide spread as this - beautiful capture. Fav! A gorgeous scene, I can almost smell the garlic! Beautiful but it would be too overpowering garlic perfumed for me! A wonderful image, quite magical. You have captured the overwhelmingness (is that a word??) of the sea of garlic. From the same spot my photos were rubbish! Simply lovely. It's time for a weekly challenge and I have looked through your lovely shots. I would like you to take a portrait that shows what the person does for a living (or study or retired). @fbailey This is än interesting challenge and I will start thinking about what I can do. 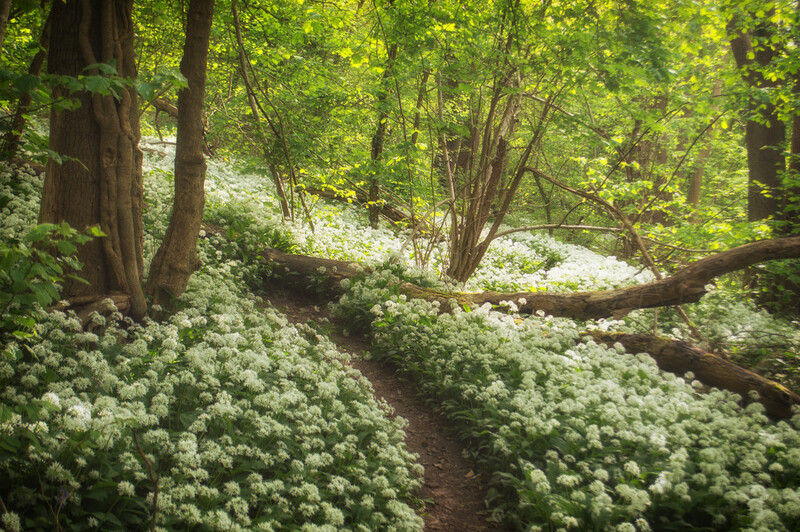 I love wild garlic and you have captured the scene so well I can imagine it. Love the path winding through. I didn't know this was wild garlic. Beautiful and educational! Would love to walk here. @pistache Thanks so much, it was a lovely surprise!